With the incredible amount of on line sales it is really important to be safe when you are making a transaction. 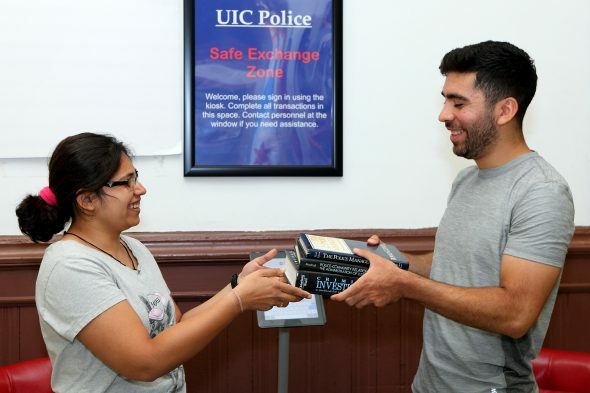 Thanks to the UIC Police, a SAFE ZONE FOR ON LINE SALES IS OPEN FOR ALL THE COMMUNITY TO USE. Open 24 hours, the police-protected area has round-the-clock video surveillance, a seating area and appropriate lighting for meetups that happen during the day or after dark. UIC Police are supplying a tablet that buyers and sellers can use at the station. Officers hope the device will help people steer clear of any fraud-related losses. THANK YOU UIC POLICE FOR BEING A GREAT NEIGHBOR TO ALL OF US. ← Chicago Marathon is a month away. Cheer on with us!